No biggie here. 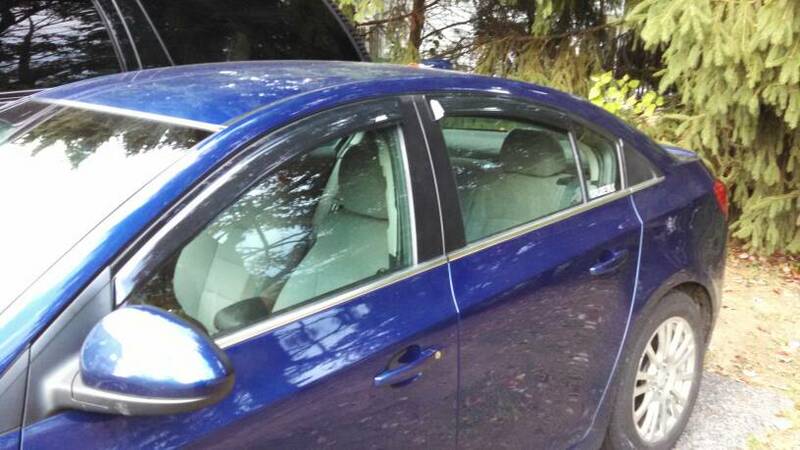 Found a set of AVS rain guards for the Cruze on Ebay for $46.00 full set of 4 and after owning the 2012 for almost 3yrs now I got sick of getting wet when it was raining with the driver side window slightly cracked for some fresh air. Last edited by NYCruze2012; 10-21-2014 at 08:25 PM. Missing our 1st generation Aveos everyday! I love my weathertech window visors. With all for windows cracked on a rainy day I can sit my car parked(not running) with hot food or a coffee and my windows don't fog up at all. Nice I don't need to use the AC to keep the foggin down, so helps keep my MPG up. Also helps keep my windows from freezing shut in the winter, most mornings before I couldn't open my window until 20+ minutes into my drive. revjpeterson and Dvan5693 like this. Here ya go! I like the way they look on the car. I'm very happy that I put them on finally. I have to second the opinion on the Weathertech visors. I installed a set of Lund in-channel visors that I had found a deal on from Amazon just after I bought my Cruze last year. The rear passenger visor flew off sometime within a week of installation, and I was never able to install the visor on the driver's door, because it wouldn't install in a way that didn't interfere with the auto-up feature on the window - so the window's safety reverse would kick in whenever it got near the visor. The only way to close it was to stand outside the vehicle and "help" the window up with both hands so that it didn't face resistance from the visor. Last week, I installed the Weathertech visors and they have been perfect. spacedout and Merc6 like this. These are the ones that stick on outside of the window channel on the door frame. Typically the product I used is Ventshade and I have never had a problem in all the years I've been using them. Last edited by NYCruze2012; 10-21-2014 at 07:33 PM. I really want to install window visors on my Cruze but I'm afraid that when my tints fade, it'll show. "Cherish every moment, live everyday like it's your last." You know its going to be a few years before that even happens anyway. It's not an instantaneous process. I have had them on my Suburban for over a decade with tinted windows and window visors and it still doesn't look that bad at all. I would go ahead and buy them and put them on anyway I don't think really you have anything to lose.